Is Something Missing from Project Management? There are many elements to a project … requirements, schedule, cost, quality, human resources, communications, risk, procurement, and… Every project is complex and extremely difficult to manage to successful completion, even those considered “small.” The majority of the life of a project occurs during its execution. Although the execution phase is preponderant, there doesn’t seem to be much emphasis on it. The literature, the training, professional meetings, and conferences do not commit proportionate energy to methods and techniques to prepare project managers for monitoring and reporting performance. Neither do these venues for knowledge transference bring focus to addressing performance measures and indicators or using them for controlling the project. This paper examines the assertion and proposes the application of Earned Value Management and its extension, Earned Schedule, as a way forward. Over the last 30 years, from about 1980 until the present, there has been a significant evolution in software development, quality systems and project management. The foundation for this advancement in practice is strongly connected to a few devoted quality experts and world events occurring more than 70 years ago. After World War II the United States (U.S.) was the predominant industrial nation in the world. The U.S. produced. The world consumed. The quality of the U.S. products was of little concern; they would sell regardless. This economic position was held until about 1970 after which the market for U.S. products declined. Beginning with the post war reconstruction, Japan’s business leaders learned and adopted manufacturing practices the U.S. utilized during and prior to the WWII. Most notably, the Japanese were taught the methods of quality by W. Edwards Deming. As Deming had prophesied to Japan’s leaders, economic growth came from their dedicated use of the techniques he had learned from Walter Shewhart at Bell laboratories. During the 1980s Japan’s automobile industry began to make noticeable inroads into the U.S. market. Their success was an alarming wake-up to U.S. manufacturers, who recognized that they truly had serious competition. Thus began the quality revolution in the United States. No longer was quality perceived as an expendable portion of the production process, largely ignored. During this period, Deming videos and seminars were commonplace. Every industry was determined to improve their operation and business practices using the methods and practices of Dr. Deming. With pervasive emphasis, the methods of statistical process control and continuous improvement were taught to managers and workers alike. For those of you who are old enough to have experienced that quality training, I am certain you will recall vividly the “Red Bead” experiment, which opened our eyes and minds to the concept of natural variation. If you have never heard of the experiment, I highly recommend doing a bit of research; it will be well worth your time. Editor’s note: Second Editions are previously published papers that have continued relevance in today’s project management world, or which were originally published in conference proceedings or in a language other than English. Original publication acknowledged; authors retain copyright. This paper was originally published in PM World Today on-line journal (December 2010). The article is no longer accessible as the journal ceased publication with its last issue in March 2012. The article has been published, as well, in The Measurable News (2011, Issue 2), CrossTalk (2013, Vol 26, No. 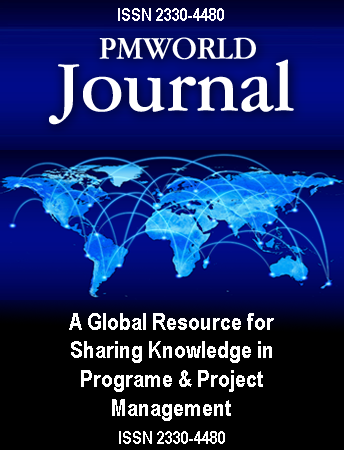 4), and translated into Portuguese for the Brazilian publication, Mundo Project Management Journal (2015, June-July). Walt Lipke retired in 2005 as deputy chief of the Software Division at Tinker Air Force Base, where he led the organization to the 1999 SEI/IEEE award for Software Process Achievement. He is the creator of the Earned Schedule technique, which extracts schedule information from earned value data.